As a roofing contractor, keep in mind that many of the customers you have that require new gutters do not have a clue how the actual gutter is attached to roof’s fascia. I happened to be visiting a friend this past weekend, and having an eye for gutters, I asked him a random question: Do you know how your gutters are attached to the roof? He said: Easy… don’t they just nail the gutter to the roof? I asked him again: When you clean out leafs from the gutters, do you remember seeing some sort of bracket inside the gutters? He said: Yes, what are those for? They can be a little annoying when I am cleaning the gutters. I explained to him that the “brackets” are called gutter hangers. 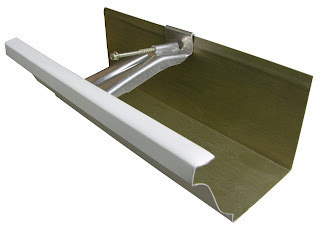 Their role is to hold the gutter in place, making them one of the most important facets to a gutter system. I emphasized how the gutters just don’t hang on their own; they need these hangers for strength and support. He understood now that the gutter hangers hold up the gutters on the roof of his house, and are the connections between the fascia and the actual gutters. We have quite an array of gutter hangers. Don’t hesitate to visit our website, www.GutterSupply.com, to find what you need for your next job. Our friendly and knowledgeable staff can help you choose the right gutter hanger for the gutter project in your near future. We have ornamental hangers, Aluminum Hangers, K Style Hangers, T Bar Hangers, Half Round Gutter Hangers, Half Round Rival Hangers, and Half Round Outside Decorative Hangers – we have many hanger styles and varieties, each serving their proper application for each style of gutter you need for your contractor services. < Previous post: Guess what suffers the most in your house with faulty, leaky gutters? > Next post: Happy Earth Day!